The basic PSKMETER enclosure comes with blank (un-machined) end panels. WIth this upgrade option, you get an end panel that has been pre-punched with a perfect DB-9 socket cut-out. No drilling, filing or sawing here. The only holes you need to drill are for the power plug and BNC. In addition, you get clear plastic rubber feet to finish your enclosure. PSKMETER hardware designed to fit the end panel. 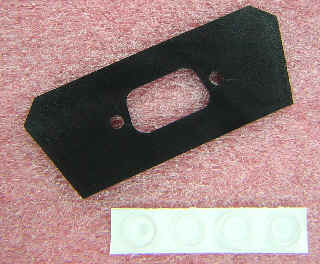 End panel comes with professionally machined cut-out for the DB-9 connector.